Aparo-Griffin Properties ~ "Real Estate Now" was opened in December 2004 by Top Real Estate producer Kathy Aparo-Griffin and her husband Bill Griffin. At Aparo-Griffin Properties you will find everything you need "NOW." We are available to all of our customers "NOW", - after hours, nights, weekends, and holidays. We maintain a close working relationship with a diverse group of lenders to meet the different needs of each buyer. Our lenders are also available to get you prequalified at no cost or obligation to you, "NOW". 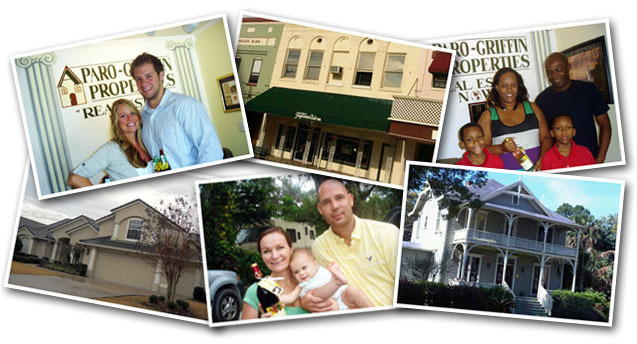 We have a very knowledgeable TEAM at Aparo Griffin Properties that come from various backgrounds. Among our staff we have a general contractor, retired real estate attorney and multiple agents with Masters Degree’s in various areas of study. Our diverse group is also well rounded when it comes to international languages in our office we speak Spanish, Italian, German, Indian and Afrikaans (spoken in south Africa). Aparo Griffin Properties is one of the few approved affordable housing partners in Volusia County. We have participated in first time buyers programs for over 12 years. We work with SHIP, NSP, Florida Bond and many other programs. Each of these programs requires much training and continuing education on our part. Down payment assistance varies based on buyers income and credit scores. WE WORK WITH ALL OF THESE PROGRAMS and so do our lenders. Down payments can be as HIGH as $38,000 including an additional $6,000 in closing costs. Other programs we work with allow $15,000 for down payment and as long as you live in the home for 5 YEARS …YOU DON”T PAY ANY OF IT BACK….it’s FREE money. We pride ourselves in offering top-notch real estate service and our customers feel the same way as we received the Angie’s list SUPER SERVICE AWARD which is only earned by the TOP 5% in the county. We are also a member of the Better Business Bureau. So whether you are a first time homebuyer, need a short-sale(to avoid foreclosure) or are looking for your dream home that you plan to retire in we have the best staff in Central Florida ready to be at your service. Come visit us soon. "EVERYBODY works for you, the client. They are problem solvers with YOUR best interests as a goal! Aparo-Griffin gets it done for even the most demanding client. Nobody, could ask for more."